Having emotions is common during interviews. But, what kind of emotions do we actually have? Which ones are good and which ones aren’t? Find out what emotions most people have during interviews and how you can control them in order to make a good impression and land the job of your dreams. If you have attended interviews before, we bet you will relate to this pretty well. Keep reading to find out more. Here are some of the most popular and basic emotions we all go through at some point during an interview. If you have attended interviews before, you will be able to relate with some for sure. 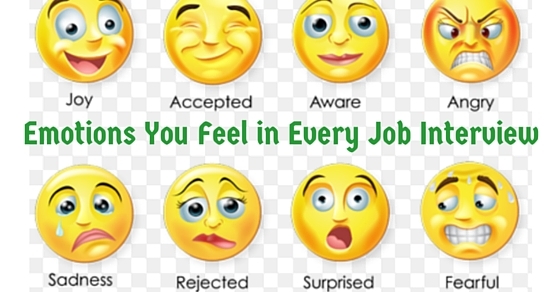 Emotions are common during job interviews. But one that you will feel the most is called excitement. After learning so much about job interviews, we found out that people often tend to get very excited. They have weird and baseless ideas that come into their minds while answering questions. There are so many things that one can feel during interviews. Whether they will be able to answer this question or not, if they are making a good impression or just being boring, whether their nervousness is becoming obvious or not, these are very basic things that every candidate feels. It all falls under excitement. There is always a sense of panic in every candidate when they are attending an interview. They always wonder what exactly the manager will ask them next and if they aren’t able to answer, what will happen to them. Panicking is actually quite common although it can be treated very easily if you know how to handle interviews. For that you have to practice answering questions at home. This will surely help you avoid such problems. A lot of people doubt themselves when they are attending an interview. They wonder if they are doing a good job or not. It is understandable if you feel the same, especially if you can’t read the expression of the person you are sitting in front of you. Feelings of doubt happen often and can be taken care of if you try to develop a good personality and work on your self-esteem. You will definitely be able to fight this feeling and handle yourself in a much better way during interviews. A fourth feeling that occurs among most people is the feeling of elation. If they have answered a question correctly and have been able to understand the expressions of the recruiting manager, they feel very excited. If you have done the same during interviews, then you really have to be able to control yourself. Being happy is a good thing but over excited is never acceptable. Be mindful of that! Those who have hunted for jobs for months and still haven’t found something worthwhile often experience this. Another feeling you are most likely to feel during interviews is the feeling of desperation. Most people are desperate to get the job of their dreams so they will literally say anything to the manager to get them hired. If you are feeling like this during an interview, you should really slow down. Being desperate is definitely not the right way to land a good job. If you really want something, be patient and show your personality in a good way. Do not waste it by saying silly and senseless things. You might also feel a whole lot of frustration while attending interviews. Sometimes when we want the interview to go in a certain way and it turns out the exact opposite, we get all upset and unhappy about the whole thing and that could lead to major frustration. It is common but shouldn’t happen during an interview. At least you should not allow the recruiting manager to know what you are feeling like at this point. Your frustration can be showed elsewhere when there is nobody around you but interviews are definitely not the place to show. Stressed out is also something we notice quite often during interviews. Some people get stressed out too fast. It wont take them more than a minute to feel stress. Some common signs of stress include dangling their legs, wiping the sweat off their face, having a scared expression on their face etc. If you have felt that way during a certain part of your life, do know that its common but can be taken care of with a little patience and lots of practice. Try it at home before attending an interview. Embarrassment is yet another popular emotion we bet most of you get to feel during interviews. This happens if you haven’t been able to handle an interview the right way or haven’t been able to answer a question. If something like this happens, you have to remember that you are human and mistakes like these happen very often. You should get past it immediately and focus on answering the next questions in a better way. That would help you a lot more than anything else, especially if the interview has just begun. The feeling of impatience is not new to those who have attended interviews before. Though it is very easy to feel annoyed and frustrated, we would request you to stay patient. Impatience is something that occurs only when you are waiting for the interview to begin and its taking up too much time. Or maybe you are waiting for the results to know whether you are in or not. Try to have better control and stress less about things like these. Life will be easier that way. Now this is also what most people experience, especially if their interview went good. If you have felt like this at a certain point, you know exactly what we are talking about. Looking at the mirror at the end of the interview and knowing that you look good will make you feel better and give you hopes. Plus when an interview comes to an end, people are mostly relieved. After all, what you have waited for all this while is finally complete and you will have nothing to stress over now. Feeling agitated is something that happens when you are simply running out of patience during an interview. Maybe you don’t like the questions being asked to you. Maybe you are not with the recruiting manager or you don’t agree with what they just told you. Or maybe you are annoyed and just don’t want to do the interview anymore because you feel like your patience is being tested big time. If something like that happens, know that interviews don’t last for hours and it will soon be over. You will feel much better once you realize this. If you are attending an interview for the first time or maybe this is the first time you are trying something different, chances are you will feel stressed out. But don’t be at all. Being nervous and anxious about something is definitely no way to solve a problem. Plus it will not help you during the interview. If you want to do a good job and impress the recruiting manager, just draw a smile to your face, feel good about yourself and go for that interview like a boss. If you feel like you are way too good for the job, then there are chances you will feel way too proud about yourself; thinking that you are a know it all and the questions they are asking you are below your level and stupid. If ever such thoughts cross your mind, we completely understand but being arrogant and proud is never a good thing. Try to attend it like any other interview. After all, being over confident could actually ruin your chances of having a good conversation. You might not even get the job you wanted. How to Control your Emotion during an Interview? Now some of you are not going to believe this but breathing in and out can really help you do a good job during interviews. It will help you have better control over your emotions and handle yourself in a much better way. Health experts have also suggested that breathing is something you will be able to regulate and control. It is a very useful tool for getting a better and relaxed state of mind. If you want to have better control of your emotions, we would definitely suggest you to stay positive in general. Laugh a lot, smile at others, show your confident and happy side when you are attending an interview. Read up some positive quotes before it and make sure you have eaten a good breakfast. When your thinking is positive, negativity can in no way enter. You will have a better control of yourself and managers will like you more in that way. When you are attending an interview, try not to fidget as much as possible. When you play with yourself, you have less control over your emotions and give away a bad impression to the recruiting manager. So to save yourself from something like that, try to be calm and composed and keep your hands and legs to yourself. Dress right, wear some good cologne and smile. Answer in brief and focus on the questions being asked to you. You should not be having too many emotions while attending an interview. That is something you must learn from home. Always know that what happens to us is just 10% of everything but how you react to it takes up 90% of the whole thing. Always make rational decisions and don’t answer according to what your heart tells you. Listen to your mind instead. Only that can help you have better control over your emotions and handle interviews like a professional would. Making some conversation can really help you get over those anxious feelings that most of you feel during interviews. When you speak to a friend or someone who understands your feelings well, you are able to communicate and speak better, that will also give you a good idea of how you should be behaving during an interview and where exactly you are going wrong. Making conversation is always therapeutic. So go ahead and do it today. Feeling all kinds of emotions are quite common during interviews. In fact we experience different stages of emotions when we are attending one. Having emotions is normal but not being able to control is another thing. In this post we have given you really interesting and simple ideas on how to control your emotions. If you make a point of these notes, you will definitely be able to see great results! This brings the post to an end. If there is an emotion you have felt during interviews and has not been mentioned here, do let us know about it in the comment box below. We would love to hear from you. Also your comments, ideas and posts are always looked forward to by us. So keep us posted and on that note, Good luck!